"Designed by London-based Chetwoods Architects in partnership with HuaYan Group. The project will consist of two buildings, representing the male and female dualistic aspects of Chinese culture. The taller tower, Feng will have about 100 floors for residential living, offices and retail space. 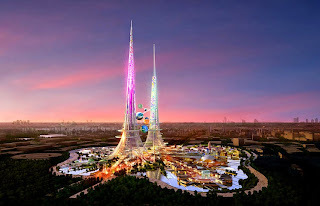 The slightly smaller Huang tower will contain "the World's tallest garden". 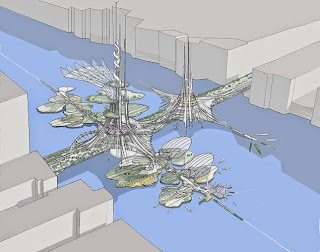 The towers will be constructed on an island in a lake, covering a 7-hectare (17-acre) site. The buildings will be constructed on a steel superstructure with concrete cores and buttresses. The exterior will be covered in photovoltaic panels. 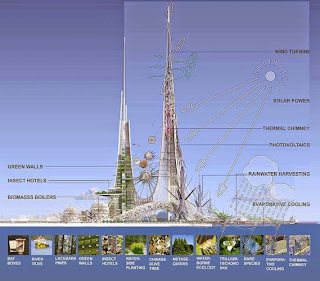 The towers will incorporate green energy technologies including wind, solar, thermal, biomass boilers and hydrogen fuel cells [and] the world’s tallest garden." "In China there’s a lot of competition between cities trying to out-‘spectactularize’ the next city,” [...] Chetwood and his team embraced the mandate to design something grand while layering in symbols that speak to China’s cultural heritage and future aspirations. "They were looking to put Wuhan on the map," he says, and the original design for the mixed-use commercial and tourist hub "wasn't spectacular enough."